Keep counters clean! 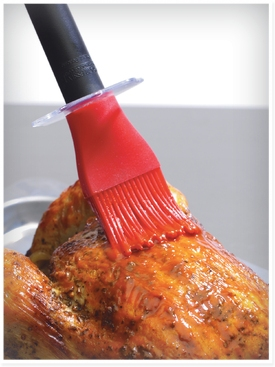 No more annoying messes from this basting brush. Unique wavy collar keeps the dripless basting brush head elevated to prevent messes and keeps the brush from rolling off the counter. Dripless basting brush is 10.25Ó (26 cm) in length. Silicone bristles are heat resistant to 600¡F (315¡C) and will not shed. Perfect for use with egg wash, oils, sauces and melted butter.